At first I thought I would introduce this edition of the journal as a collection of articles with no discernible common theme, which of course would not necessarily be unusual for the journal. The more I thought about the five feature articles, however, the more I realized that there is a common thread. Here’s what I mean. Micah Brickner was just appointed last July to be the new executive director of the Society, and the second article in this edition helps readers learn to know him and understand his desire to use his new position to encourage more study of the past to inform the present and future. Specifically, Micah writes about the impact of the Brethren in Christ Church’s first publication, the Evangelical Visitor, that existed for 117 years from 1887 to 2004. Micah discusses the four consequences of the Visitor that Brethren in Christ historian Carlton Wittlinger outlines in Quest for Piety and Obedience, and then relates the obstacles that Visitor editors faced to the communication issues the church faces today in a digital age. Who will accept the challenge of beginning to answer the questions Micah raises about the nature and role of communication forms and technology in today’s church? Articles by Lucille Marr and Devin Manzullo-Thomas, respectively, describe Francis Davidson’s call and the “unity and diversity” in the church from 1935-1950, and also illustrate how research into the past can teach us important truths for the present. Lucille’s article reminds us again of how valuable personal diaries and journals are for researchers, and provides new insight into the mind of one of the most important women in Brethren in Christ history. If we find ourselves defaulting to consideration of male leaders of the past and present, we would do well to be more intentional about finding out more about female leaders and their experience—even mystical ones such as Davidson’s. 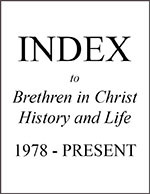 In his article, Devin describes the efforts of church leaders in the 1930s and 1940s to maintain unity in the midst of increasing diversity, and how a “rhetoric of community” developed that paved the way “for the enforcement of communal adherence to several central theological tenets or principles, while allowing individual members freedom to determine their own convictions about certain more peripheral topics.” One question for today might be whether that “rhetoric of community” still stands—how are we doing at maintaining “unity in diversity”? Finally, there are the stories of five men who registered as conscientious objectors (1-W) during the Vietnam War in the 1960s and did alternative service at Mary Hitchcock Memorial Hospital in New Hampshire. I found out about these stories from a former United Zion representative to the Historical Society board. Since the United Zion Church is one of those “related groups” mentioned in our mission statement, it’s appropriate that we include the stories in these pages. (As it happens, three of the men are now Mennonite, one is Brethren in Christ, and one is United Zion.) Even though the stories are ordinary accounts of everyday experience and not deep analyses of the theological or moral reasons for their choosing conscientious objection, they are important. They remind us of the rich tradition of conscientious objection to war and alternative service, and prompt us to ask whether and how we are encouraging young people today to live out the biblical call to peacemaking as we have articulated it in the Pursuing Peace core value. The journal closes with a review essay of six novels by Brethren in Christ author Ken Abell and reviews of four books related to such diverse topics as re-imagining the church, Wesleyan Holiness, Pentecostal and Holiness statements on war and peace, and the book of Philippians. Correction: The photo on p. 254 of the August 2017 edition incorrectly identified the person at the right of the photo. It is Fred Holland, not Frank Kipe.